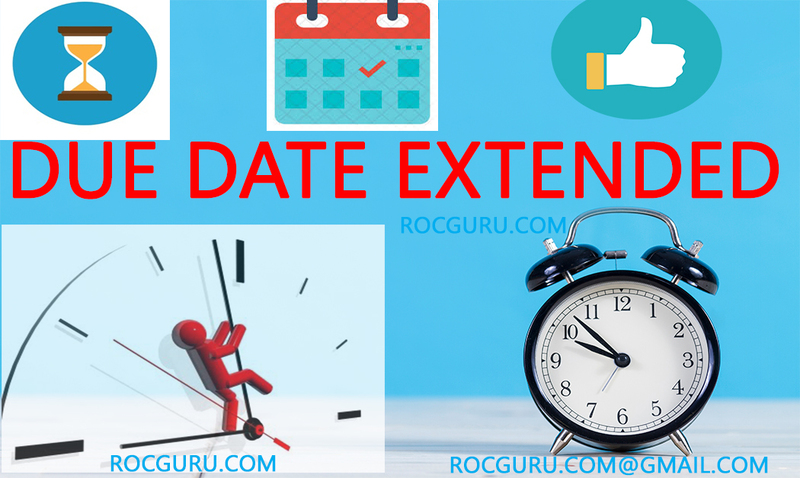 Extension of ROC Annual Filing Due Date till 31st December, 2018 Extension of ROC Annual Filing Due Date till 31st December, 2018 - RocGuru: GST Filing| Business Registration |Trademark | EPF & ESIC Compliance. MCA has notified vide General Circular No 10/2018 dated 29th October, 2018 extended the due date for filing of ROC Annual Return in forms MGT-7 (Annual Return) and AOC-4, AOC (CFS) AOC-4 XBRL (Financial Statement) has been extended upto 31st December, 2018 without any levy of additional fee. The additional fee waiver vide General Circular No.10/2018 dated 29th October 2018 is likely to be implemented by 31st October Midnight. Stakeholders may please take note and plan accordingly.